This 4-1/8" bore cylinder and piston kit replaces the cylinders and pistons on S&S V124 engines for 1984-'99 big twins. 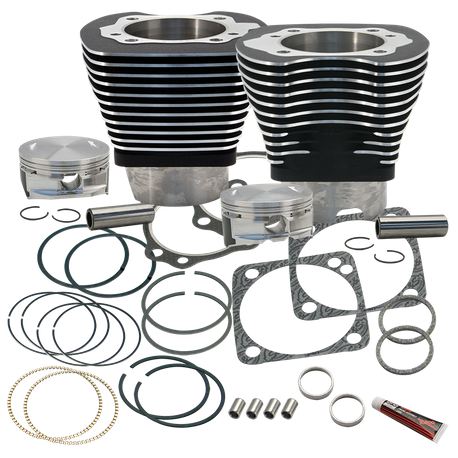 The kit contains S&S 4-1/8" bore cylinders and forged pistons, rings, wrist pins, head and base gaskets. Pistons are flat topped design intended for use with S&S Super Stock cylinder heads. The cylinders are machined with the S&S bolt pattern and are intended for use in S&S crankcases used in S&S V124 engines. Designed for 4-5/8" stroke flywheels, resulting in 124" displacement. Cylinder finish is a durable wrinkle black powder coat. For best performance, appropriate camshafts, performance air cleaner, performance exhaust and fuel system tuning are required. EFI engines will require tuning. S&S recommends Dynojet® Power Vision® flash tuners for 2001-'16 engines with Delphi® EFI systems. Not legal for sale or use on CA or EPA pollution controlled motorcycles.